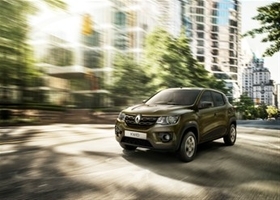 Renault's Latin American sales rose 12 percent, helped by the introduction of the Kwid. PARIS -- Renault Group's global sales rose 3.2 percent to a record 3.88 million vehicles last year, aided by results from a recent joint venture in China with Brilliance Jinbei, and growth in Africa, Russia and Brazil. Sales growth in 2019 will be "slight," Renault said in a statement. on Friday. Growth will come from Russia, forecast to rise by 10 percent, and Brazil, expected to gain 3 percent, while European sales will be stable, Renault said. "Volumes progressed across almost all our regions and we're entering 2019 with expectations for a slight increase in sales," Renault sales chief Olivier Murguet told reporters. Murguet said that growth in Africa, Russia and Brazil "was able to offset almost all the economic and geopolitical headwinds outside Europe." Sales fell in Turkey, Iran, China and India. Murguet also said Renault had no plans to stockpile vehicles in preparation for Britain's exit from the European Union in March, in case London and Brussels fail to reach an exit deal. "Stockpiling is expensive and short-termist," Murguet said, adding: "we'll take an extremely pragmatic sales approach and adapt extremely rapidly." Without including 166,000 vehicles sold from the Brilliance venture, group sales were down by 1.2 percent in 2018 compared with 2017, in a global auto market that grew by 0.2 percent. Renault brand's volume was down by 5.2 percent to 2.53 million cars and light-commercial vehicles. Car sales at Renault fell by 6.2 percent, while LCV sales rose by 0.3 percent. Sales at budget brand Dacia and Russian brand Lada showed strong growth, with Dacia up by 7 percent to 700,798 vehicles, and Lada rising 19 percent in a recovering Russian market to 398,282 vehicles. Renault's sales mix shifted to 51 percent outside Europe, compared with 49 percent in 2017, with sales up 6.1 percent in global regions. European sales were largely flat, growing by 0.5 percent, following a surge in 2016 and 2017 from an overhauled lineup. The introduction of the fifth-generation Clio, Renault's best seller that will debut at the Geneva auto show in March, will help second-half volumes this year, the company said. Sales in Russia, the group's second largest market outside of France, grew by 11 percent, slightly behind the market, which grew by 13 percent in 2018. Lada sales were up by 16 percent, while Renault's Russian sales dipped ahead of the introduction of the Arkana fastback crossover this year. In the Africa-Middle East-India region, sales fell by 16 percent overall with India losing 27 percent after recent success with the Kwid small SUV faded. Renault said the introduction of a new model in the second half of this year would give sales a boost there. Sales in Iran were down sharply to 101,347 -- from 162,000 in 2017 -- as Renault said it would withdraw from the market there after U.S. sanctions were reimposed. Those declines were countered by growth in Morocco, South Africa and Egypt. Latin American sales rose 12 percent, driven by an increase in Brazil of 29 percent. That growth was largely due to the introduction of the Kwid. Sales in the Asia Pacific region, which includes China, rose by 68 percent, but that growth was due to the integration of sales of Jinbei and Huasong utility vehicles from the Brilliance joint venture. Overall sales in China were 216, 699. Renault has set a target of 550,000 sales by 2022. A small electric vehicle based on the Kwid is expected to debut this year, and Renault has invested in JM, China's fifth-largest electric vehicle makers.